Swim team has started, so we are now running out every weeknight to either soccer practice or swim practice, so we have about a 20-30 minute window for dinner. Luckily, most nights, my husband picks my son up after work and brings him home, so I have the opportunity to have dinner ready when they walk in the door. My son really likes chicken tenders and cutlets, and they end up being a meal he can eat quickly and be ready to play about 1/2 hour after dinner. Filling, but not too heavy. The chicken looks big, but it is a very thin cutlet, so it is about 2 1/2 oz of meat. With a side of kale chips, this was just the right about of food. For each cutlet: Dredge it in the flour and shake off any excess. Dip it in the egg mixture, then in the breadcrumb mixture, pressing to coat both sides. Arrange in a single layer on the baking sheet. Refrigerate, uncovered, for 1 hour. Heat the olive oil and margarine in a large cast iron or non-stick skillet over medium-high heat. 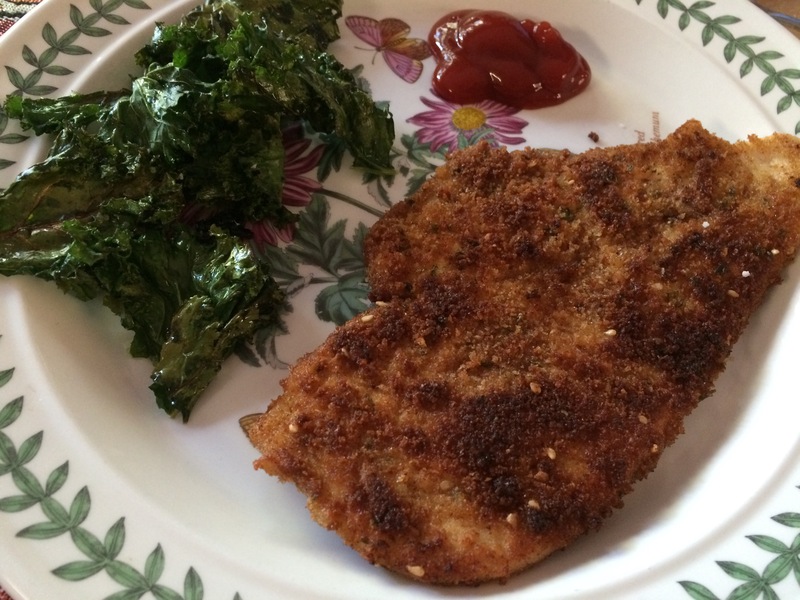 Working in batches, fry the cutlets until golden brown and crisp, about 3 minutes per side. Remove to a rack or paper towel-lined plate to drain.